Injuries sustained due to a personal injury, need to be correctly treated. If you are in the midst of a personal injury case, then it is extremely important to keep up your doctor visits. If you are unable to due to financial reasons, then it might be time to turn to pre-settlement funding. Pre-settlement funding allows you to receive the cash you need in order to continue your medical treatments. If this is the case, then speak with your lawyer on how pre-settlement funding can help you with paying for your medical treatments. In the meantime, it is still important to continue visiting your doctor or doctors. This is because an insurance company will require proof that you are visiting the doctor, in order to accurately measure your claim. But, just visiting a doctor isn’t enough. Check out these four mistakes you will want to avoid. 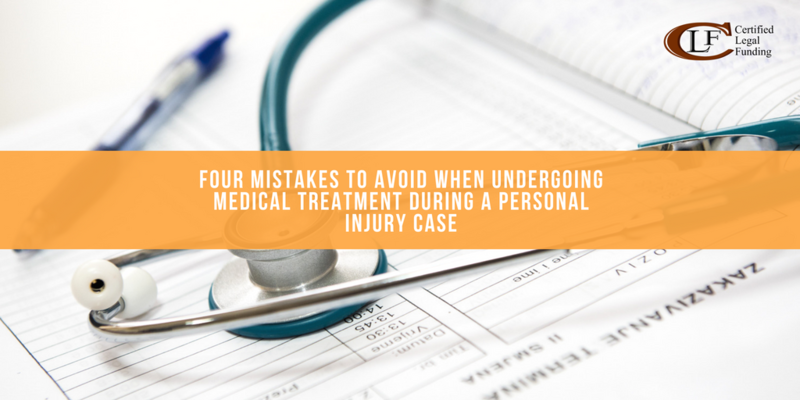 One of the biggest mistakes that personal injury victims make is that they don’t seek immediate medical treatment after an accident. Many of them claim to be fine but actually aren’t. This is because it could take months before symptoms show up. By going to a doctor immediately after an accident, you can avoid this by having a medical professional diagnosis any problems or potential problems early on. The longer you wait, the harder it is to prove that your injury was a result of the accident. So, make sure to seek out immediate medical attention. Follow up appointments exist for a reason. If your doctor schedules you for one, don’t skip out. They have a reason for making it in the first place. For example, your doctor may have noticed something that concerns them and they want to keep an eye on it. Or they just want to check in on your progress. Whatever their reason may be, don’t blow it off. Plus, it will look bad for your case. We already established that skipping out on follow up appointments is bad. Failing to take your medication is even worse. Your doctor prescribed your meds because you need them. If you stop taking them without an okay from your doctor then it may look bad for your case. Don’t stop taking your meds unless first consulting with your doctor. Outright stopping medical treatment without your doctor’s approval is the same as giving up. This signals to the opposing side that your claim is false and that you aren’t really injured. If you think your treatment isn’t working or is a waste of time, don’t stop. You still need to prove that you require these visits for your claim. Again, your doctor chose the recommended course of action because they believe that it is necessary for your recovery. Now is the time to secure your financial future while you await your settlement. Don’t settle for anything less than the amount you deserve. Make sure you receive the money that should be awarded to you by calling us at 1-800-922-7439 today. We are available 24/7, because we know the world doesn’t stop for anybody. So, let CLF have your back with pre-settlement funding. I was sitting at red light / no fault. 2 speeding reckless drivers trying to beat yellow lights shoving a SUV head on into me causing $7700 plus damages to front car. I was awarded ssdi 1 month before for stress related issues. The at fault ins co knew I needed a car for 2 reasons. 1. Go get medical attention for shoulder injury. 2. I was 58 and the ONLY CARETAKER of 2 abandoned grandchildren 3mts old and 1.3 years old. My shoulder burned like Hell nights NO SLEEP. They ignored me for MONTHS offered not even a adjustment on car. I told them though emails (certified) that the morning after accident I dropped my 3 Mt old due to upper back and shoulder pain and informed them that I just recieved ssdi for stress andvto please just do there job. Months went by. 1/4 year went by. Although finally I found someone to watch kids I trusted had MRI shoulder RETORE YES RETORE some all the way Thur a previous 2004 very successful operation. The wreck was pandemonium kids bleeding crying cars all totaled. And the cops helped me though all front my car in back of my Lincoln MKX with headlights hanging out asked me if I was ok to GET OUT WAY, for ambulances and how far did I live? 3/4 mike away and I WENT HOME. The pain increased substantially with all yes all and a tore bicep according to orthopedic surgion most likely not repairable BECAUSE THEY TORE THUR MY STICHED UP SUCESSFUL OPERATION. To me? It caused MORE DANAGE TO ME HAVING BEEN OPERATED ON 14 years earler than it would have had I had 0 previous injury. Only makes common sense. This in’s co without ever making me a offer tried TWICE TO STEAL MY CAR, to junk it 1st 2nd attempt to force me to pay storage and the manager of their prefered shop told me that’s a lie and the ONLY LEVERAGE INHAD WAS MY CAR. They lied to me my wife and caused marrage problems. BAD FAITH IS NOT EVEN THE WORD INWIUOD USE. Criminal acts of attempted THEIFT and I don’t mind naming them USSA. The worlds largest most profitable ins co out there. Fooling people with their OH WEBTGERE FOR VETTS. Bullxxxx yes I finally HAD TO HIRE A FIRM. I fixed car at my expense to go about recovery and young babies.